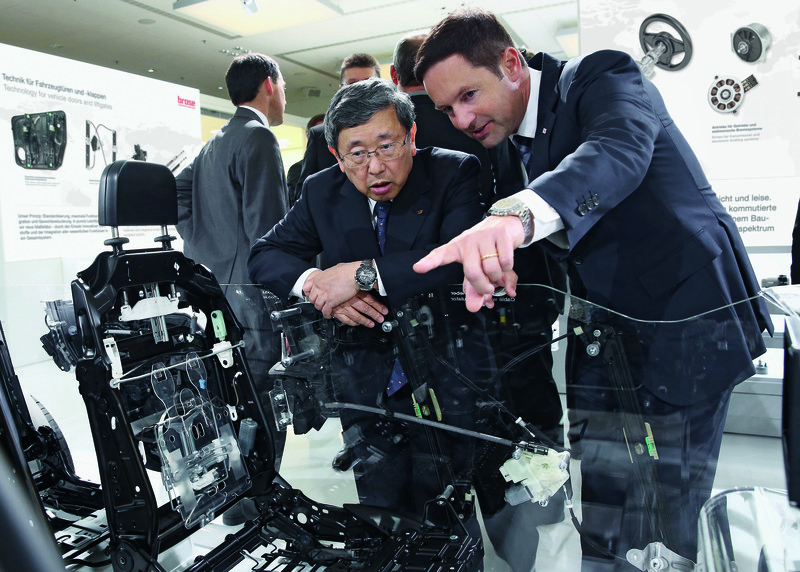 The demand for Brose products is rising steadily in Asia: Jürgen Otto, CEO of the Brose Group, shows Dr. Shuhai Toyoda, President Toyota Boshoku, the latest product concepts. The company plans to significantly expand its activities in this growth region in the future. The Brose Group has further expanded its market position in the 2013 fiscal year. However, the main impetus from growth came solely from Asia and North America. Consequently, sales increased slightly by 4% to 4.7 billion euros. This figure was presented by Jürgen Otto, CEO of the Brose Group, at the Shareholder and Advisory Board meeting on May 17 in Berlin. Thanks to its high export share, Brose managed to compensate the continued slow business in Europe. The automotive supplier generated about 50% of its sales in China and North America. Worldwide high ramp-up costs for new products had a strong negative impact on the operating result so that the target rate of return was not achieved. The seat systems division posted the biggest increase in business: sales doubled since 2010, rising 13% to 1.2 billion euros. Brose's world market share in power seat adjusters thus increased to 27%. The company also managed to consolidate its leading position in door systems and window regulators : at 2.4 billion euros, the door systems business division accounted for the largest share in total sales. Sales revenues from the electric motor business rose to 1.1 billion euros. The mechatronics specialist is the market leader in four of six product areas in this segment. In 2013, the Brose Group made investments of around 264 million euros or 6% of its sales with a special focus on expanding existing and new production sites. In addition to setting up three new plants in East London/South Africa, Melfi/Italy and Bremen, the company expanded its pre-production facility in Shanghai/China and built a new high-bay warehouse with 9,700 storage spaces in Ostrava/Czech Republic. The excellent capacity utilization rates enabled Brose to create 1,650 new jobs, almost a quarter of which in Germany. The biggest workforce expansion took place in manufacturing operations to manage the higher number of customer call-off orders and multiple product ramp-ups. The Brose Group currently employs more than 22,000 people, including 355 apprentices. This represents a growth rate of 8% compared with the previous year. "The further increase in business volume was only possible thanks to the commitment of our employees worldwide," said Michael Stoschek, Chairman of the Brose Group. "The shareholder meeting has therefore decided to let all employees including temporary workers share in this success." At more than 28 million euros in total, the amount to be paid out in profit-sharing bonuses is the highest in the company's history. In terms of sales, the Brose Group is one of the top 40 automotive suppliers in the world and is the fifth largest family-owned company in the industry. As an industrial employer, Brose is a major economic factor, buying materials, services and capital goods worldwide worth almost 3.6 billion euros each year. In addition to the 22,000 employees of its own, around the same number of staff is employed by its more than 1,000 suppliers in Germany and abroad. The surrounding area of Brose's Franconian sites in Coburg , Hallstadt/Bamberg and Würzburg also benefits from the positive development. At the end of 2013, Brose employed 6,730 people, including 285 apprentices, in the region. Another 2,850 people are employed by local suppliers of the mechatronics specialist. The purchasing power of all direct and indirect employees' net pay amounted to 264 million euros and substantially strengthened the business of the commercial, industrial and service companies in the region in 2013. In addition, Brose purchased materials and services worth 291 million euros from regional companies last year. For 2014, the Brose Group is anticipating an increase in sales revenues by 8% to approx. 5 billion euros. The shareholders agreed on a 920 million euro budget for investments, which is the highest volume for an investment program in the history of the Brose Group. The main areas of focus will be the expansion of capacities in the USA, Mexico, China and Thailand, but also in Eastern Europe. "We aim to achieve controlled, profitable and self-financed growth to safeguard our independence and flexibility as a family-owned company," explained Jürgen Otto, CEO of the Brose Group. The trend towards lightweight design and improved efficiency opens up new development potential, which is further spurred by increasingly stringent CO2 regulations in Europe, Asia and the USA. Thanks to the integration of functions and use of innovative materials and technologies, the Brose Group has gained a competitive edge in this area and is well positioned to meet the challenges of the future. Based on its long-standing experience as a market leader for electric motors, the mechatronics specialist has developed an innovative drive concept for e-bikes. Weighing just 3.4 kg, the electronically commutated motor is the lightest in its class on the market and can be fully integrated into the bicycle frame. Following the excellent verdict of the trade press and having received first orders, the company decided in 2013 to start series production. Production start is scheduled for June 2014 in our Berlin motor plant. Brose is thus the only supplier to offer a drive system "made in Germany". The necessary investments also helped create and secure jobs in Berlin – the city where Max Brose founded his first company in 1908.